It is Palm Sunday today. It is also the beginning of the Holy Week. Holy Week will lead to Maundy Thursday which is Jesus’s last supper and then, Good Friday which is the day Jesus was crucified. 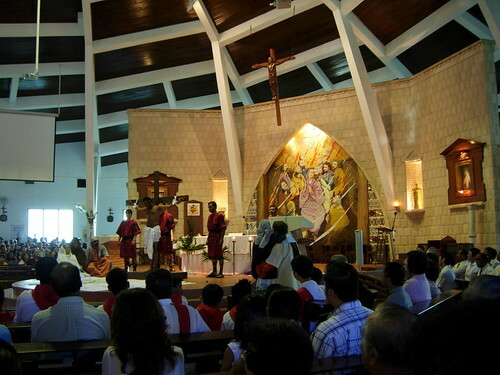 Then, it is Easter Vigil on Saturday and Easter Sunday. 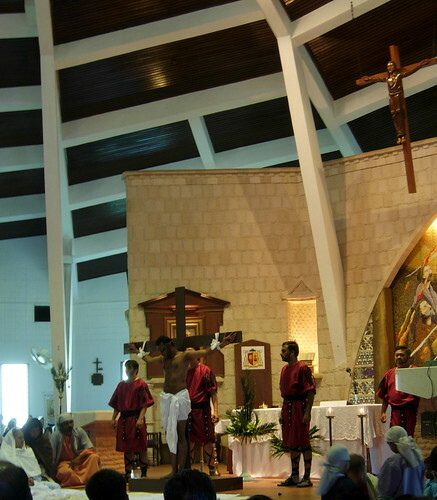 Palm Sunday is the day when Jesus enter Jerusalem. On that day, the people welcomed Him by waving palms. But by Friday, they condemned Him and shouted ‘Crucify Him!’. This is the part I like about being a Catholic. We experience these every year with some things (I won’t call it ritual) we do physically. 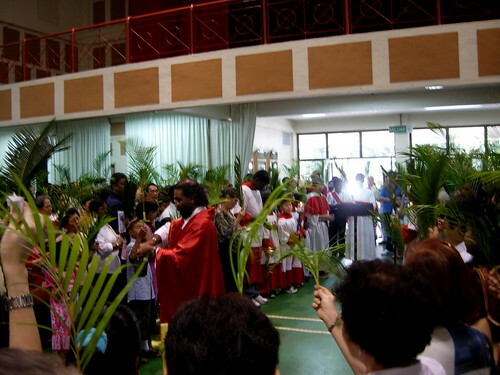 On Palm Sunday, the church folks will each take a palm leaf which will be blessed with Holy Water. Then, we have a little procession in the church ground. (definitely church ground or else kena water canon liao, wei, LOL) Palm Sunday means many things to different people. Palm Sunday to me is a reminder to stay faithful and not easily swayed. Whether it is faith for our Lord Jesus Christ, our spouse, our children, siblings or even our rulers. I do not want to be like the fickle minded folks who chanted their welcome and the next few days, changed their minds. Strong faith can lead to many things, often sweet rewards. But it is not easy to stay firm in faith. The Cathedral of the Holy Spirit Shalom Youth group presented a skit at our mass this morning. It was very touching as they had made everything so real. From the sound of the hammer hitting the nail to the cries of the women at Calvary. Bravo to the team who must have trained very hard for this. Their short skit has touched many parishioners. I wanted to post about Palm Sunday when I got home from church this morning but my previous post took priority because I feel it is something that I have to say, and make my stand. For I believe that if I am given the voice, I have to say it. My Palm Sunday reflection in 2006 here. IC church youth also put on a skit. Not bad. The youth are more active now than when I was a kid. Way back then we were only interested in badminton and camping…and also bullying Fr. Thoo. Des – The youth ministry has been revived and the group is very dynamic now. My son just attended a 3-day leadership training. They have so much fun now. Have a Blessed Holy Week, Lilian, ATM and children!! !